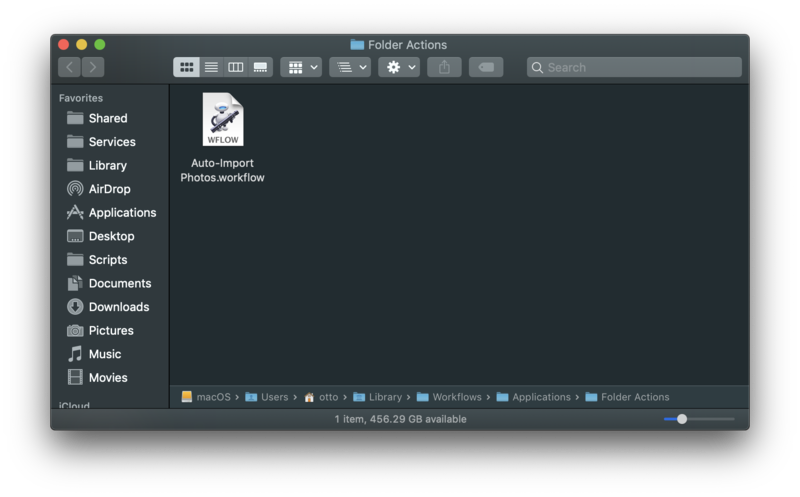 1 The Folder Action workflow window. 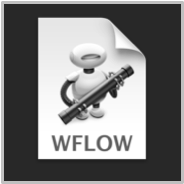 Folder Actions are saved as workflow files, instead of applets, and are executed by the system “FolderActionsDispatcher” background process. 2 Since a Folder Action is “attached” to a folder in the Finder, its input is files and/or folders added to the target folder. 3 The “attached folder” is selected from the popup menu, which summons a file/folder chooser dialog. 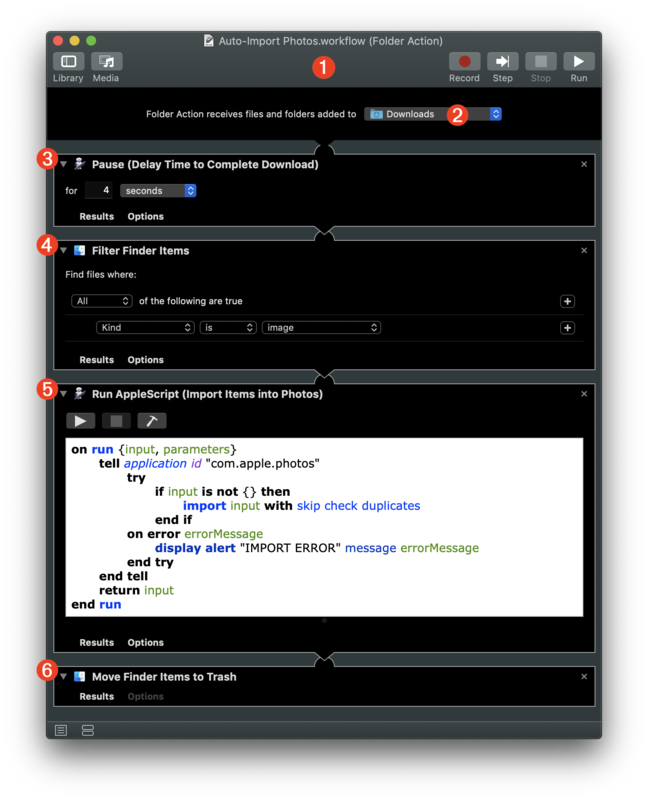 4 The workflow assembly pane where the workflow is assembled by adding actions from the Automator Library in the sequence in which they are to be exectued. 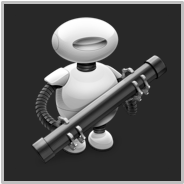 Here’s an example of combining the use of an Automator Folder Action workflow with an AppleScript “Watcher“ applet to create an autonomous AirDrop image repository whose content is added to by others through a non-attended import process triggered when users AirDrop images to the unmanned host computer. 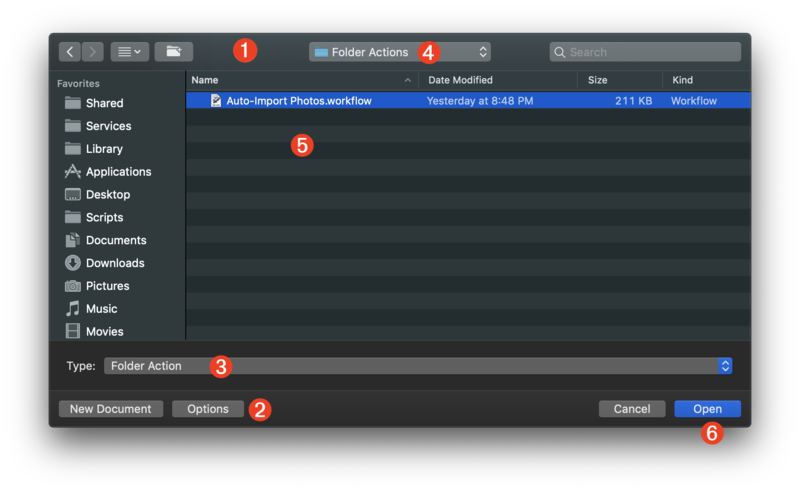 The first step is to create an Automator Folder Action workflow that will import the images placed into an “attached folder” in the Finder, into the Photos application. 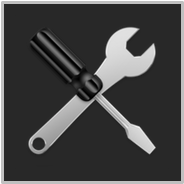 DOWNLOAD the completed Folder Action workflow file. 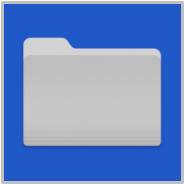 2 The “attached folder” is the set to be the user’s Downloads folder in the Home directory. 3 The Pause action is added to give the items added to the attached folder, enough time to complete the copy process before beginning their processing by the other actions in the workflow. The delay value is indicated in seconds. Set this value to a higher value if the added files are larger and copied over a network or by AirDrop. Files added locally on the computer, require little or no delay. 4 The Filter Finder Items action is used to ensure that only image files are passed to the next action for import into Photos. NOTE: since Photos can store multiple media types, such as videos and images, you can adjust the filtering parameters of this action to reflect the type of import data you want the workflow to support. 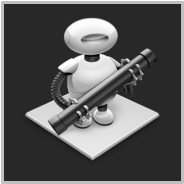 5 Since Automator’s built-in Import Files into Photos action remains broken in the latest version of macOS, a Run AppleScript action is used instead, containing a simple AppleScript script (see below) that imports the passed image files into the top-level of the Photos library. 6 Since Photos stores a copy on imported data, the Move Finder Items to Trash action is used to remove the original image files from the Downloads folder, and place them into the trash. 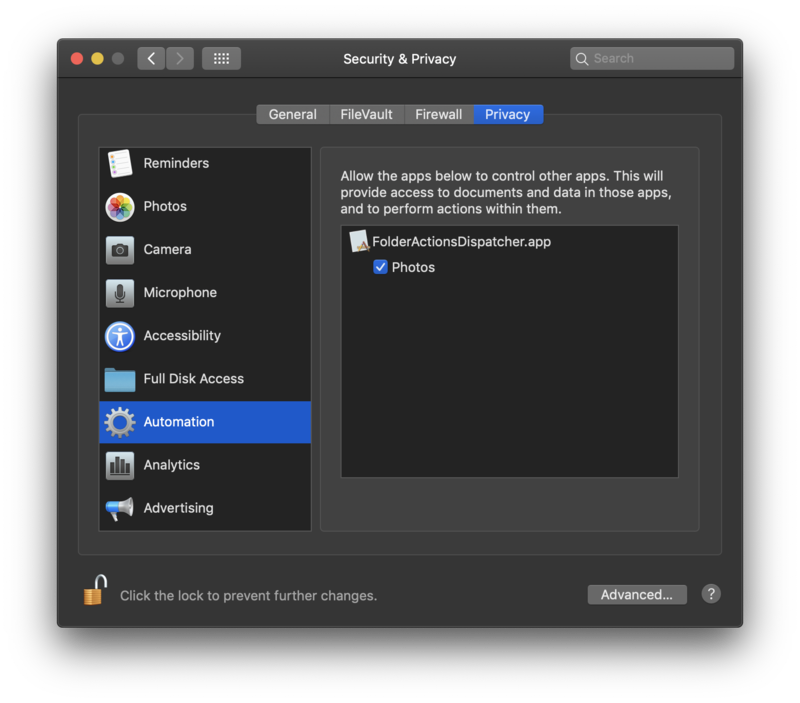 02 tell application id "com.apple.photos"
To save and install the Folder Actions workflow, type Command-S (⌘S) or choose “Save…” from the File menu in Automator. Enter a name for the workflow in the forthcoming naming sheet. 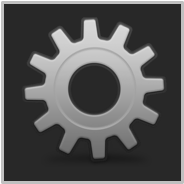 Click the sheet’s “Save” button and the workflow will be installed in the following directory and the Folder Actions server will be activated. 1 The file chooser dialog. 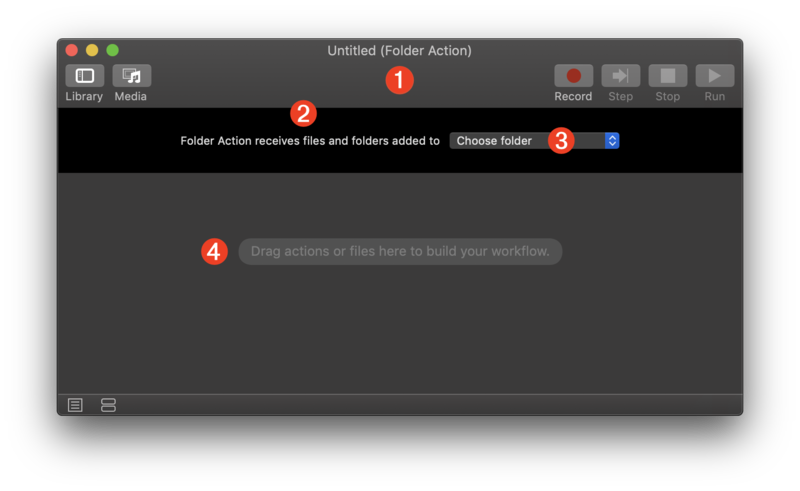 3 Select “Folder Action” from the workflow Type popup menu to reveal the contents of the system Folder Actions folder 4 in the dialog. 4 The Folder Actions folder within the system Workflows folder. 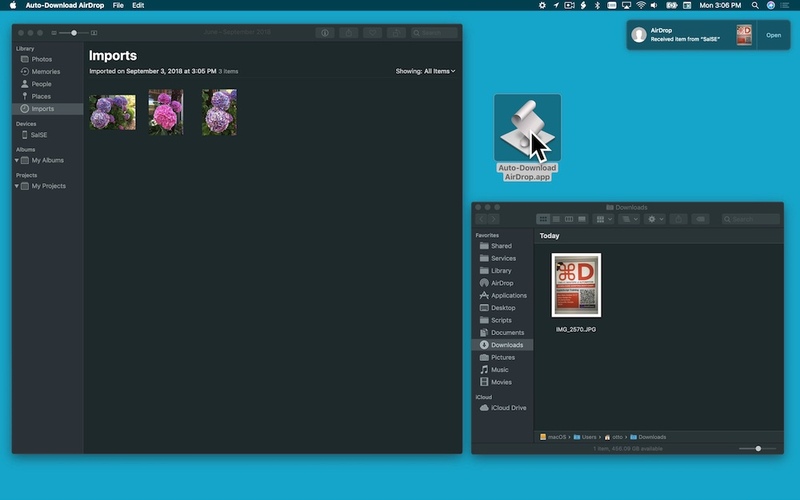 5 Select the workflow in the Folder Actions folder. 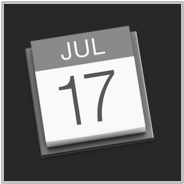 6 Press the Open button to edit the workflow in Automator. 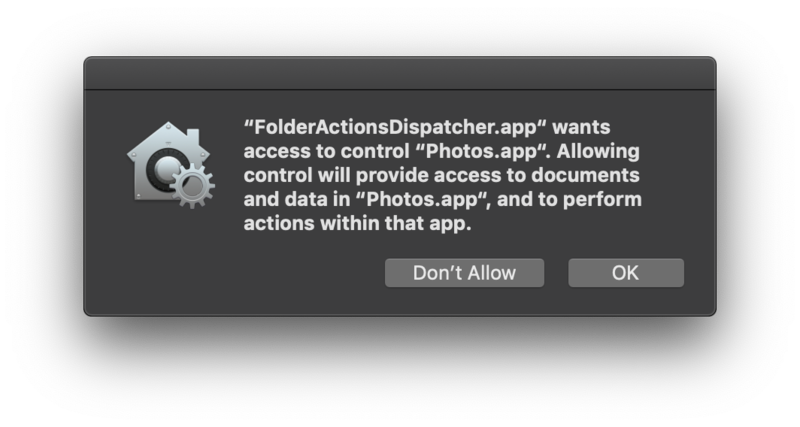 NOTE: if you later edit the Folder Action workflow, you may be prompted again for a security approval. See the section on Automation Security for more information. Mention of third-party websites and products is for informational purposes only and constitutes neither an endorsement nor a recommendation. 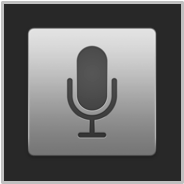 MACOSAUTOMATION.COM assumes no responsibility with regard to the selection, performance or use of information or products found at third-party websites. MACOSAUTOMATION.COM provides this only as a convenience to our users. MACOSAUTOMATION.COM has not tested the information found on these sites and makes no representations regarding its accuracy or reliability. There are risks inherent in the use of any information or products found on the Internet, and MACOSAUTOMATION.COM assumes no responsibility in this regard. Please understand that a third-party site is independent from MACOSAUTOMATION.COM and that MACOSAUTOMATION.COM has no control over the content on that website. Please contact the vendor for additional information.